Apparently everyone who owns an RCX eventually goes to Radio Shack and picks up Cat. No. 276-1657 Assorted Cadmium-Sulfide Photocells (5). This package comes with three small CdS photocells and two large ones. 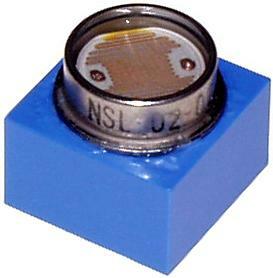 The small ones are used in numerous homemade sensor designs, including many functionally identical to my own. There are two large cells, one of which comes in an enclosure (see the picture on the right). The only novelty in my design is the method I used to mate with LEGO electrical connectors. Most other designs use 4/40 machine screws or 3/16" OD brass tubing (LEGO studs are actually 5mm in diameter) to simulate a conductive stud. Actual LEGO stud connectors only connect along a 90 degree arc. In a certain pattern in a 2x2 field of studs this makes it possible to mate with a standard LEGO wire in any of the 4 orientations. 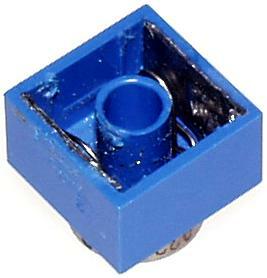 Fully conductive studs require care when attaching a LEGO connector wire. To make my light sensor I milled off the studs of a blue 2x2 brick (with a dremel tool) and inserted the wires of the photocell through holes in the top. While the wires were hanging through I soldered each one to a precut strip of 0.01" zinc (zinc is sold in thin strips for keeping moss off of composite roofs). Once I was satisfied that the joints were good (tested with a multimeter) I superglued the photocell to the top of the brick. I then removed the ridges from the inside walls of the brick and thinned the wall slightly. Then I inserted each zinc strip into place (originally they were slightly longer and extended out of the brick) and superglued them. At this point the excess wire leads can be stuffed down into the brick gently (taking care not to short them out). The zinc was trimmed to length with diagonal cutters and then ground to the exact length with the dremel tool (taking care to remove the sharp edge). The result is an ambient light sensor (used in passive/raw mode on the RCX) with huge dynamic range compared to the LEGO light sensor. A few inches from a 60 watt bulb you get raw readings around 4, and in a mostly dark room you get readings over 400.